Take pigeon peas into a pressure pan and wash it. Add water and soak the dal for 30 minutes. Meanwhile wash and peel the raw papaya. Cut the raw papaya into half and remove all the seeds if any. Cut the papaya into medium sized pieces and add them to the soaked dal. Cover the pressure pan and cook the dal and papaya. After first whistle, cook the dal on low flame for 5 minutes. Switch off the flame and let the pressure pan cool down. When the pressure pan is completely cooled off, remove the lid and add salt, red chili powder and turmeric powder. Heat a pan and add oil to it. When oil is hot add black gram anf fry till the seeds start changing color. Then add mustard seeds and cumin seeds and fry till they splutter. Then add asafoetida and curry leaves and fry till the curry leaves are crisp. Then add the seasoning to the dal and mix well. Cook the dal on medium flame for a minute adding required amount of water. When done transfer the dal to a serving bowl and serve hot with plain rice and any pickle. Soak the dal for half an hour. This will reduce the cooking time and dal gets cooked evenly without fail. Before soaking the dal wash it properly. Do not use the peel and seeds of raw papaya in any recipe. 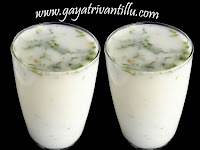 Generally peels of vegetables like bottle gourd, pumpkin, ash gourd, ridge gourd etc can be used in any gravy preparations or in recipes like Sambar, Majjiga Pulusu, Pulusu etc.. But peels of papaya won’t be good to use. So use the peels and seeds of papaya by mixing it with soil and use it as manure for your Kitchen Garden. Raw papaya can be used as a substitute for pumpkin and bottle gourd in many recipes. Use it in Aloo Kaddu Torkari or Sambar or Molakuttal or in Gavial etc. Raw papaya dal is a bland dal yet tastes good (KAMMAGA UNTUNDI). Serve it with plain rice and any hot pickle. 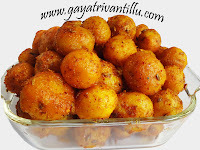 nenu mee website dwaara chala vantalu nerchukunnanu. naku Raw Papaya curry ela cheyalo telusukovalani undi. This is a great site. I wish I have found it long before. I went from page to page in the site learning much more than recipies. I pray that you continue your good work. very intresting . i tried all your recipes. your voice is good. after watching your videos i am your fan. once again thankyou for your cooking tips. wonderfull recipies!!! All those recipies and the way u tell the preperation method reminds me of my mom...thanks and keep shazring! !